In guebs we are enthusiastic about Ruby and not only for its bright and colorful logo, but for the elegance of its syntax, the power offered and because it helps you be more productive. 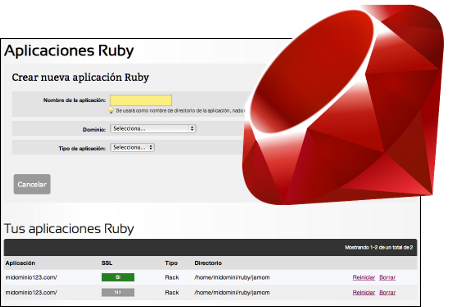 In 2006 we were the first Spanish vendor to offer shared hosting with Ruby support, since then we have learned and improved gradually. And now, we again highlight offering the broader solutions specifically designed for the accommodation of Ruby applications range. We offer undoubtedly the best shared hosting service for Ruby, we can highlight the simple deployment of Rails and Rack applications We can install the gems you want or can choose the version of Rails. This is ideal serrvice for most web sites. On the other hand, if you do develop websites for your clients in Ruby, our Reseller plans offer all the benefits of our shared hosting but also allow you to take advantage of better prices, flexibility to create hosting accounts immediately and the convenience of being able to manage all accounts from a single tool. For sites with heavy traffic, business applications or advanced virtual shops we recommend the use of a Cloud Premium server, which offers all the advantages and ease of a shared hosting along with the power and privacy that only a dedicated service can offer. What more do you want? Maybe a Git repository for your application? Maybe a project manager to coordinate the development of it? We will give you free. Just being guebs client you have access to our Forge, Do not miss it!